After the 2018 Joint Admission Matriculation Board (JAMB) Examination written by over 1.6 million people, reports had it that Moses Ape from Benue a student of the New Covenant Christian College International was the highest candidate in the 2018 conducted examination with a total score of 354. 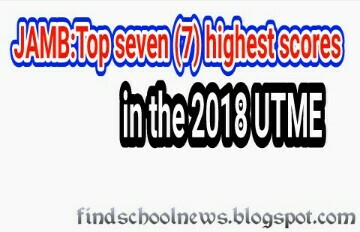 But according the recent top seven (7) highest scores for 2018 examination the boy was proven not to be the first, Jamb Head of Media, Dr. Fabian Benjamin promulgated to the public on the 5th of August that the news report was untrue and also announced that Galadima Zakari is the highest with the total score of 364, the board equally demands the retraction of the false news. He sat for the 2018 UTME examination in Ogun State, he scored 364 which is the highest score. He is from Ogun State, he wrote his examination in Abeokuta he became the second highest with 358 Jamb score. From Edo State while he wrote his examination in Ekpoma he came out as the third highest with 357. The 4th highest went to Ademola from Ogun State who scored 355, he wrote his examination in Lagos State. 7. Obi Obuoha Abiamamela from River State all had the same score of 354 completing the top seven (7)highest scores for 2018 UTME. The board spoke man also addressed organizations and individuals who want to use JAMB data for research purposes to always find a way contact the examination body for up to date and accurate information so as not to mislead the public into taking wrong conclusions.